Call: Brittany Raven on 0266598402. Email: Brittany Raven at Brittany.Raven@nswcc.org.au. Relay For Life is a fun outdoor, overnight, community fundraising event. Relay For Life is a fun outdoor, overnight, community fundraising event where teams of 10-15 people take turns to walk around the track to honour the lives of people touched by cancer. There are bands and music to keep you moving, a variety of food to build up your energy, entertainment for the kids and teams are encouraged to camp out overnight and theme their outfits and tents. All funds raised go towards Australia’s leading cancer charity, Cancer Council. Underpinned by research, 61,000 Australian lives have been saved by improvements in cancer prevention, screening and treatment over the past 20 years. But with an estimated 134,000 new cases of cancer expected to be diagnosed in Australia this year, we need every Australian to rally behind us and help continue this vital work. 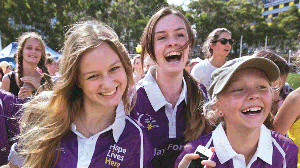 Enter your team today for the Coffs Harbour Relay For Life.